Beginners welcome. No experience necessary. Explore the central teachings of the Heart Sutra on the meditation cushion and in the art studio. Join Art Monastery Founder & Art Abbess Betsy McCall and Abbess Fu Schroeder in this immersive 5-day retreat that explores Art and Zen. We will explore the Heart Sutra as a source of inspiration in both contemplative practice and creative practice. Allow yourself to be rejuvenated by a variety of guided art exercises as well as spacious time to work on your own creative projects. We will explore the Heart Sutra as a source of inspiration both on the cushion and with paintbrush in hand. There will be sitting, walking, and movement meditations, guided creative exercises as well as plentiful time for your own creative explorations. Artistic feedback and contemplative support is available in one-on-one meetings with the Core Team. 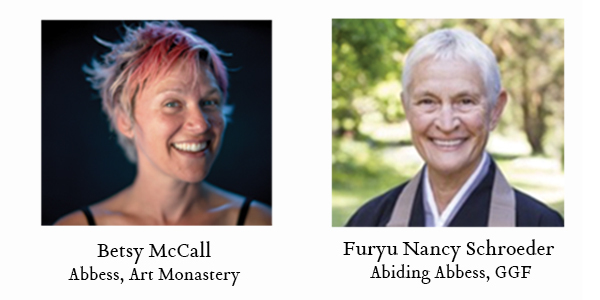 Your retreat will be led by Art Monastery Abbess Betsy McCall and Green Gulch Farm Zen Center Abiding Abbess Fu Schroeder. Betsy McCall, garnering degrees from Yale University and San Francisco Art Institute, brings her experience as a visual artist, social sculptor, competitive synchronized swimmer, and co-founder of the Art Monastery Project to inform her retreat-hosting. Investigating the relationships among contemplative practice, studio practice, and other kinds of practice (such as swim practice), her work explores breath, repetition, and pattern. Betsy’s visual artwork; which takes the form of meditative “breath portraits,” large-scale pattern-based drawings, and abstract video; has been exhibited from San Francisco and New York to Amsterdam and Rome. In 2008 Betsy co-founded the Art Monastery, an international arts organization dedicated to applying the collaborative and intentional “social sculpture” of monastic life to art-making and creativity. Betsy splits her time between Green Gulch Farm and the Art Monastery Vermont. Furyu Nancy Schroeder, a resident of Zen Center for over 35 years, became abiding abbess at Green Gulch Farm Zen Center in March 2014. Fu has held most of the monastic positions at Zen Center and has been an active supporter of programs for children, people of color, the gay and lesbian community, and the interfaith community. In 2008 she was elected to the Marin Women’s Hall of Fame, and in 2010 she was appointed to the Board of the Marin Community Foundation. In addition, she has previously co-led Zen Center’s Contemplative Caregiver Course. She received dharma transmission from Tenshin Reb Anderson in 1999. Fu currently lives at GreenGulch Farm Zen Center, Muir Beach, California. Visit Tassajara’s Rooms & Rates section and determine your preferred accommodations before making your reservations request online or by phone. Call the Tassajara Reservations office at 1.888.743.9362 (toll free) or 415.475.9362 (local) or fill out this online form. Please note that the retreat fee does not include accommodations. Retreats begin late afternoon on the indicated start date and end in the morning on the indicated end date. Visit Tassajara’s Rooms & Rates section and determine your preferred accommodations before making your reservations request online.